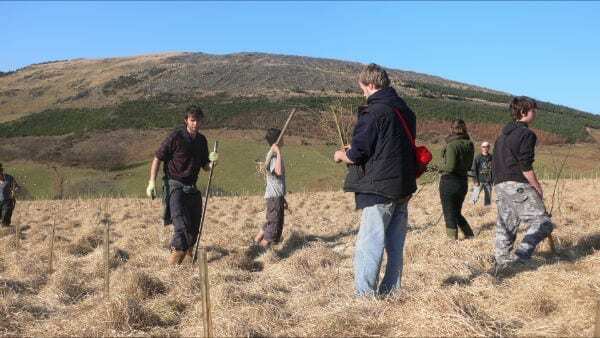 The Cambrian Wildwood group comprises the many people who have contributed by planting trees or carrying out other work or donating money. The project is run by a small team and managed by the Trustees of Wales Wild Land Foundation. It is very much a local community initiative, despite its national significance and international interest. Sue is a Town Councillor for Aberystwyth and in 2009 she was Mayor of the town. She grew up in Pembrokeshire and as a child roamed the Preselli mountains. Her love of that wilderness and the freedom it brought has never left her. She is a founder member of GAG (Greener Aberystwyth Group), a group set up to protect the tree population in Aberystwyth, planting trees in schools and encouraging their presence in new developments. GAG has been particularly active in promoting and supporting the scheme to plant trees on the approach road to Aberystwyth, which resulted in a three year grant from the Assembly government. The need to promote and sustain the countryside has never been more urgent or necessary. She is delighted to be part of this visionary scheme to restore the welsh countryside back to its original wild roots. George is a writer and environmentalist who writes a weekly column for The Guardian newspaper and is the author of several books, including the landmark rewilding publication – Feral: Searching for enchantment on the frontiers of rewilding. He is also a keen gardener and sea-kayaker. Jane is director of the Wales Institute for Sustainability at Trinity St David University. From 2007 to 2011 she was the Minister for Environment, Sustainability and Housing in the Welsh Government where she was responsible for the Welsh Government agreeing to make sustainable development its central organising principle. Prior to that Jane was Minister for Education and Lifelong Learning where she introduced several positive changes, such as an increased emphasis on learning outdoors. She was the Welsh vice-president of the Ramblers’ Association until 2007. Jane was the third most influential environmentalist in the UK for the Independent on Sunday in 2009 and is a member of WWF’s UK Council of Global Ambassadors. Simon is a professional forester, specialising in the creation of new woodland areas and the management of native woodlands, including the restoration of plantations on ancient woodland sites. A founder member of the Wildland Network, he has been involved in the British rewilding movement for over 15 years. Simon is motivated to play a part in repairing the damage to the natural world, by restoring habitats and making space for wildlife. His interests include bushcraft and exploring wild areas on foot and by canoe. Mat is a Chartered Surveyor who deals with land and buildings for public sector organisations and companies and will be using this expertise to help secure the charity’s first purchase of land. Having been brought up in a farming background Mat is keen to see traditional farming embrace alternative land uses which he hopes will improve the countryside for wildlife and the access to it. Kara is a facilitator of all kinds of rewilding – landscapes, people, and society – offering educational courses in practical rewilding, nature connection, spiritual ecology and skills for social change. She is passionate about inspiring and empowering people to connect with and protect wild nature. Kara lectures and facilitates on short courses and Masters programs at the Centre for Alternative Technology, Schumacher College and St Ethelburga’s Centre for Reconciliation & Peace, where she is an Associate Fellow. As a freelance writer she writes about wildness, environmental issues and the human-nature relationship, contributing regularly to Resurgence & Ecologist magazine. Sophie is a researcher, writer and educationalist working in the fields of political-ecology; food and agriculture; governance and policy studies. Currently, she is Lecturer in Human Geography in the School of Natural Resources, Environment and Geography at Bangor University. Previously she was at the Department of Geography and Earth Sciences, Aberystwyth University, and at the Wales Rural Observatory undertaking policy research on rural land-use for the Welsh Government. She has a background in outdoor and environmental education, and has worked with the John Muir Trust, Transition Towns Movement, Climate Camp Cymru and the Common Cause Network. Her involvement with WWLF comes from a deep love of the mountains, but she is equally happy grubbing around in her back-garden and the lovely Clettwr woods behind her home in Taliesin. Milly is a storyteller and educator specialising in promoting appreciation for the natural world through performance, stories and workshops. She has a deep love of nature and animals and a belief in the importance of people maintaining a connection with nature. She has worked in schools and many outdoor venues engaging children with the natural world, both through performance and by direct experiences, and is dedicated to extending this by facilitating more opportunities for people to access nature. She is especially keen to create possibilities for those who may ordinarily experience obstacles and who may benefit most from contact with the wild. Milly is currently studying field ecology through Aberystwyth University and is an associate of Aberystwyth Arts Centre. As a professional, Phil works in the tech and collaboration industry and so brings these skills to Coetir Anian in enabling the organisation with Social media, web and Cloud platforms. He’s equally happy in boggy upland helping nature re-assert itself on a rainy day! Nicola is social media secretary for the WWLF/STGC. She moved to Aberystwyth from North-West England in the early 90’s to study Countryside Management. Her dissertation was about the feasibility of re-introducing beavers into Wales. After graduation she found it impossible to leave Aberystwyth due to her love of the local environment and culture. Since graduating she has worked for the Welsh Government in various roles, including: G.I.S., data management, I.T. liason, and as a Tir Gofal project officer. She is currently on extended maternity leave looking after her two small children with her partner. Peter leads the ecological consultancy Ethos, pioneering work on integrating renewable energy strategies with wildland, biodiversity and community objectives (www.ethos-uk.com). He is a council member of the British Association of Nature Conservationists and author of Beyond Conservation (Earthscan, 2005), and edited the volume: Rewilding (Ethos, 2011); he is also a member of the Royal Anthropological Institute and the Wildland Research Institute. ; he is currently exploring a long-standing interest in shamanic perceptions of the natural world among indigenous people. Peter has varied interests in conservation policy, environmental strategies, climate change, and the anthropology of indigenous knowledge. He is currently in the early stages of setting up an initiative in Czech Republic for the recovery of European indigenous knowledge. This work focusses on modes of perception, causality, the nature of the sacred and traditions of inner knowledge. He believes there is a great deal that the western scientific mind-set can learn from indigenous peoples and their sources of nature-knowledge and works to build bridges between ecological science and shamanic perceptions of nature. Dominick is an Associate Professor in the School of Earth and Environment at the University of Leeds. His research aims to demonstrate the importance and value of natural ecosystems. He has a long interest in ecological restoration, collaborating with the Forestry Commission to restore 800 acres of spruce plantation in the Lake District to semi-natural woodland. He has extensive experience in applying for grant funding, expertise which he aims to put to good use in this position. He is a keen climber and kayaker and enjoys spending time in wild land.